Our small group program is a faith-sharing experience between faculty and students, outside the academic pressures of the traditional classroom setting. This setting expands the students’ exposure to Christian mentors through spiritual conversations and prayer, and also enriches and deepens student-teacher relationships. Female faculty members mentor the young women, and male faculty members mentor the young men. 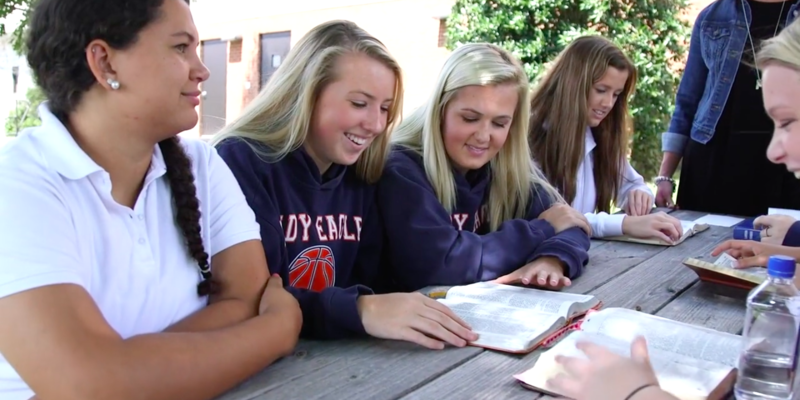 The content for discussion includes teen-relevant topics and the application of Scripture to real life issues. We start the year with an emphasis on the spiritual theme verse for the year selected by the seniors. This year it is John 13:34-35: A new command I give you: Love one another. As I have loved you, so you must love one another. By this everyone will know that you are my disciples, if you love one another. While mentoring often happens naturally and informally, small groups in high school are an intentional effort to formally foster an adult mentor and advocate for every student.